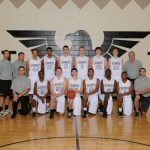 The Thunderhawks knocked off a pesky Sycamore squad on Friday by a score of 63-57. East led 29-22 at the half. Dylan Lowry poured in 25 points while Mitchell Mays added 10. Alex White grabbed 10 rebounds and scored 9. Next up the team plays at Lakota West this Friday! The LEHS Freshman Boys Basketball team participated in Kids for a Cause Toy Drive in Over-The-Rhine on Saturday, Dec 7th. The players donated basketballs and volunteered at the event by wrapping gifts. The team plans to continue to volunteer throughout the season in an effort to give back and help others.